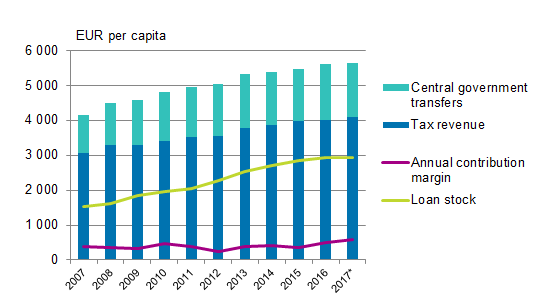 According to the 2017 financial statement estimate data, the total contribution margin of municipalities in Mainland Finland was EUR 0.5 billion higher than in the financial statements of the previous year. The annual contribution margin strengthened especially as operating expenses declined by 2.1 per cent and tax revenues grew by 2.0 per cent. These data appear from Statistics Finland's statistics on quarterly local government finances, for which financial statement estimate data concerning 2017 were collected from all 295 municipalities and 134 joint municipal authorities in Mainland Finland. The population figures on 31 December for each year has been used as the population data for 2007 to 2016. The population figure on 31 December 2016 has been used in the estimate data for 2017. According to the 2017 financial statement estimate data, the operating expenses of municipalities in Mainland Finland without internal items decreased by 2.1 per cent from the previous year and amounted to EUR 35.7 billion. The external operating revenue declined by 5.9 per cent from 2016 and amounted to EUR 7.2 billion in 2017. In the 2017 financial statement estimates, the operating margin was EUR -28.2 billion, while in the financial statements for 2016 it was EUR -28.4 billion. According to municipalities’ estimates, tax revenue grew by 2.0 per cent from the year before and amounted to EUR 22.4 billion in 2017. Central government transfers to local government, in turn, diminished by 3.3 per cent to EUR 8.5 billion. Tax funding formed of these two items increased by 0.5 per cent. Tax funding per capita was EUR 5,649 in the 2017 financial statement estimates 1) . The combined annual contribution margin of municipalities in Mainland Finland was EUR 3.2 billion. The margin increased by 18.9 per cent from 2016. In 2017, altogether 7 municipalities estimated that their annual contribution margin will remain negative while in the year before the annual contribution margin was negative for 14 municipalities according to final data. At the end of 2017, the loan stock of municipalities in Mainland Finland stood at EUR 16.0 billion based on financial statement estimates, which was EUR 2,921 per capita 2) . The loan stock declined by 0.6 per cent during the year. Municipalities spent 0.6 per cent less money on investments than in 2016, in total EUR 3.4 billion. The 2017 financial statement estimates of joint municipal authorities in Mainland Finland had EUR 13.5 billion in external operating expenses and EUR 14.3 billion in external operating revenue. Operating expenses increased by 8.6 per cent and operating revenue by 8.1 per cent. The annual contribution margin remained on level with the previous year at EUR 0.7 billion. Joint municipal authorities estimated that their investment expenses amounted to EUR 1.0 billion in 2017, which translates to a 17.5 per cent growth from 2016. At the end of 2017, joint municipal authorities were estimated to have EUR 3.4 billion in loans. It was 8.1 per cent more than in the 2016 financial statements. 1) The population data used were the population of Mainland Finland on 31 December 2016. 2) The population data used were the population of Mainland Finland on 31 December 2016. ISSN=2343-4139. 4th quarter 2017. Helsinki: Statistics Finland [referred: 25.4.2019].